Our Wishes from Captured Wishes! Captured Wishes are one of the best engagement gifts you can give because the couple who receives them will instantly realize the heart-filled emotions of those people in their lives who want to celebrate their future plans of togetherness. This vessel is designed to be given by a group so if you are shopping as a couple, as a family, for a group of work colleagues, or on behalf of friends, then "Our Wishes" is a perfect and affordable group engagement gift solution. Because they are handmade, each wish vessel is different, special, and puts into words the love and wishes you have for the happy couple at their very personal milestone. It's an all-in-one gift, verse and wish package that's one of a kind - a unique keepsake gift! This deep burgundy card is designed to be given by two or more people - even a group as the card uses the phrase "Our wishes". The card is also sprinkled with wish dust that clings to the two shadow hearts. 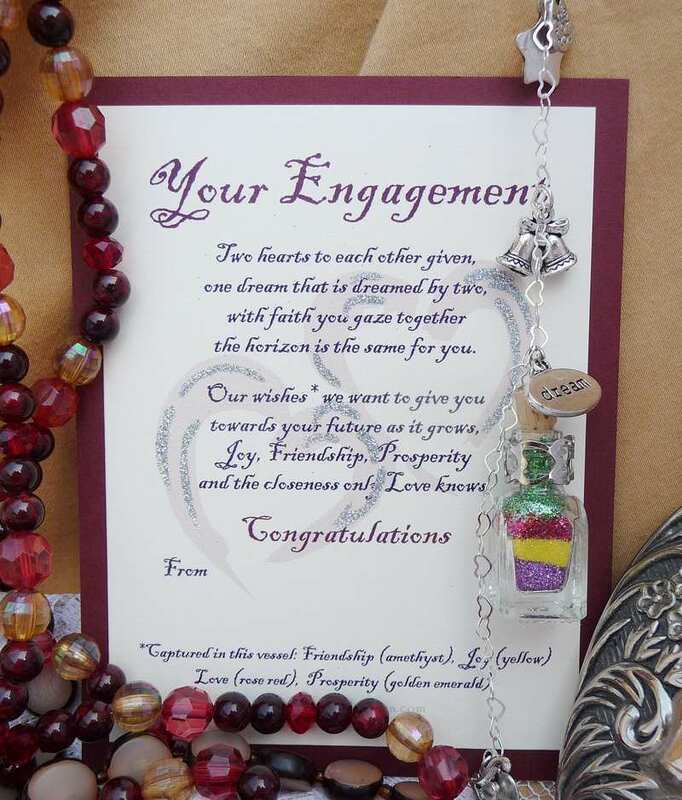 Wishes as engagement gifts - the best idea yet! When two people realize they want to spend their lives with only one certain someone, the dreams of each become one dream. Getting engaged is an exciting step to take; the joy and celebration of commitment, bonding, and turning into a new entity brings people together to share their feelings. This engagement wish vessel measures approximately 35mm x 17mm. The delicate charms, personalized to match the initials of the happy couple, make this gift unique. The package is ready to gift. Just add your signatures and love.